If the weatherman is correct for once, we are going to have some major fun this Sunday. As many of you know, although Hofstra U facilities were tight for the Striper Day Show, we always managed to have a good time (even while looking over the shoulder for a Fire Marshal to shut it down…lol) There was a long period of time when we thought that after Hofstra took away another 1/4 of available space, that we would no longer be able to put on a Striper Day Show. We looked at EVERY venue on Long Island from colleges to catering places to catholic HS. The major problem with most colleges is that their Gym is about thousand miles away from their auditorium. For example St Joe’s gym is on the other side of campus from theater. I am certainly not sending any of you across frozen or snowy ground to listen to a seminar. We felt strongly that large auditorium is needed in order to put together Striper Day type of show. Yes, we did look at Suffolk community college facilities in Brentwood. The estimate for venue ONLY without covering the floor, table rental and booths were EIGHT times Hofstra. That was just to have a conversation! I’d have to take a second mortgage on my house to put on that show with zero chance of us ever breaking even. Surf fishing shows are not made to be two days, some guys will be sold out of plugs in half hour, what they are going to to for next few days? Fortunately Bob Wilson from Ward Melville HS Fishing Club spoke to his administration and they were in favor of hosting the Striper Day IV. They say it’s always darkest before light, in this case it definitely felt that way. 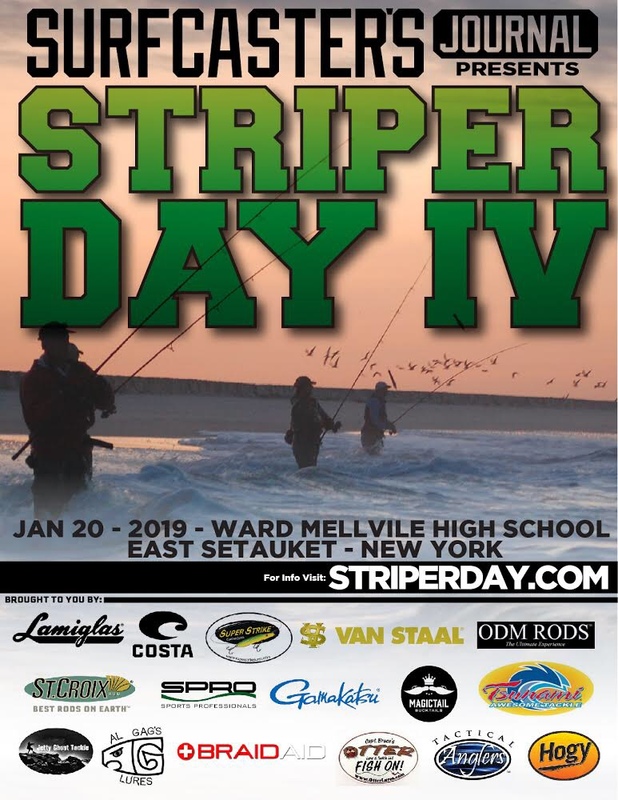 So when you do go to Striper Day IV you will find in addition to over 130 tables of surf casting specialized vendors and all day seminars, the largest Surf Raffle EVER with 100% of proceeded going to Ward Melville HS Fishing Club. The kids will be there when you walk in and you will be able to buy raffles for different products. You can see partial list bellow and its a doozy and I know there will be more added at the show. And best part you do NOT have to be present for a Drawing. We have a whole gym to ourselves (same gym that Ward Mellvile host their annual Fishing Expo) a large theater and smaller classroom for the seminars. We hope many of you will join us at this larger location and we hope that you will have a great time. 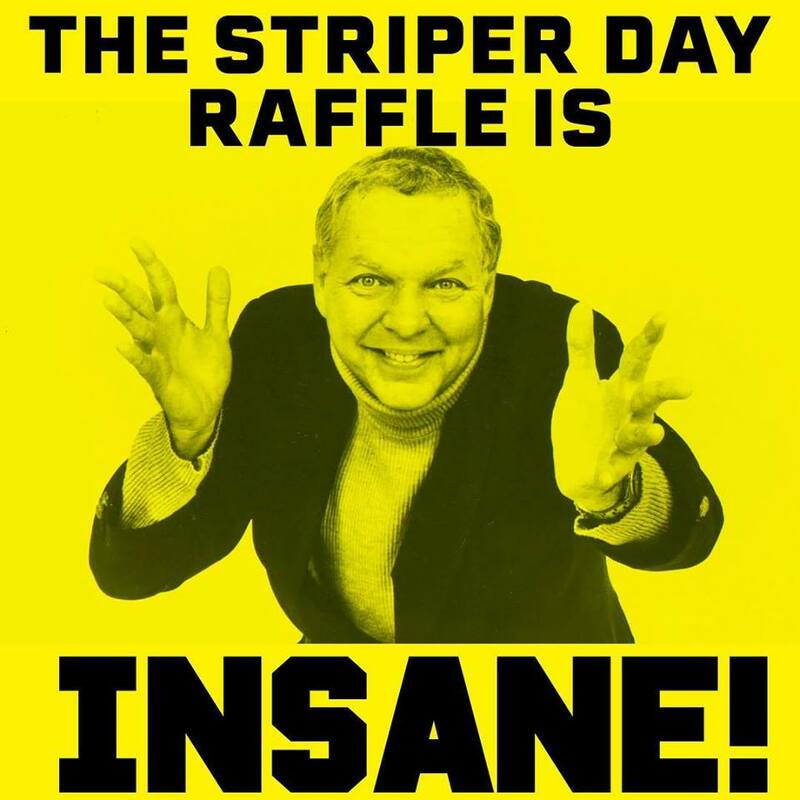 I personally hope that many of you will support the Ward Melville HS Club raffle and again i want to express thanks on their generosity for hosting the event. We will try to get doors open early, for those people on line so they do not have to wait in cold(South Side general admission, north Side vendors only). At what time will this happen, an hour or two before show starts, I am not sure. This is up to school security and out of our hands. But we will make an effort in trying to accommodate those on line early. Having said that, this will only happen if there are no persons trying to get access to the school before 5 AM. We are guests here and we were already warned that even a small transgression will be enough to put any future show in jeopardy. It is hard for me to comprehend why certain individuals cannot understand that this is a High School in residential neighborhood and not college facility like Hofstra. Some people who have kids of their own would tear apart anyone walking at night at their precious child school, but think of nothing of doing the same thing at a fishing show. I will never understand or accept this. But this is a tiny minority of people, most of Striper Day attendees are there to catch a seminar, talk shop with vendors and see friends. You can renew your SJ subscription at the discount by getting a shirt or hoodie with your subscription. we have out YouTube Super Star Lou Caruso on a Big stage this year so I am sure many of you will enjoy that (PS For you NE guys who cant make this weekend , it is my distinct pleasure to announce that Lou Caruso will be at SJ booth at RISAA all weekend , so stop by and meet the Man ). The new location in East Setauket is very convenient to the NE guys as its only minutes away from Port Jefferson ferry. Of course there is a tradeoff as new location is further for NJ guys. But to me, having the ability to get everyone inside in 10 minutes after door opens and eliminating long lines and staggered start times is worth it. Oh yeah, I almost forgot. First 500 guest will receive a goody bag from our sponsors. 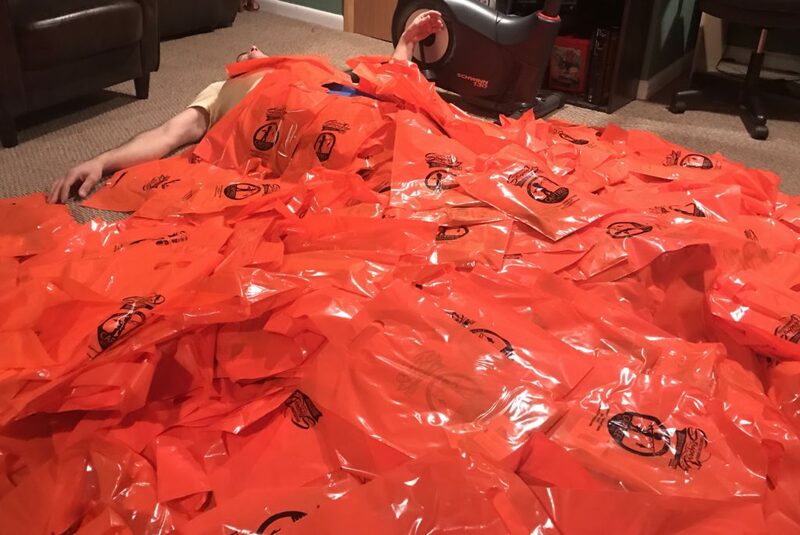 We decided to sprinkle the hundred Super Strike plugs among the goody bags and then mix all the bags up, so your buddy’s bag might be different than yours. That was exhausting!!! Can’t wait, see you Sunday!!!! I’m happy you are doing this show on Sunday .i work on Saturday. Few of my friends and I will be there. honestly, we would rather do it on Saturday, probably because we were used to it. But HS have sports programs so to do it at all must be a Sunday. Hope to make it with the crew from plum island but if the weatherman is right we are going to have to pass and we will stop in and say hi to the SJ crew at RISSA show. Crossing our fingers we get down. Is there going to be a show like this for us in New England? Thanks for keeping this going guys! Regardless of the site, we know its a lot of work and still great to have a show on LI to kick of the year! When do we find out about the results from the raffle?